Want to kick up the CPU of the base model? No problem! Adding a beefier CPU, more memory, or more storage is now easier... and possible! Good news for Apple fans looking to pick up a Retina MacBook Pro: Apple's unveiled a bunch of new customizability within its online ordering system. In doing so, interested purchasers are no longer forced to switch from the baseline Retina MacBook model to Apple's pricier model just to gain the benefits of a particular upgrade. In other words, buyers can now pick and choose what kind of upgrades they want to tack onto the baseline model of Apple's Retina MacBook Pro. The move gives savvy selection-pickers the chance to save a little bit of money, depending on which preferences they pick. Here's the issue: When Apple first launched its Retina MacBooks to the public, the company limited the ways in which a person could customize the load-out of the baseline Retina MacBook model (starting at $2,199). In fact, the only real way that one could tweak one's baseline Retina MacBook order was to upgrade the laptop's memory from 8 gigabytes to 16. That's it. Those looking to dip into more storage for the Retina MacBook or a speedier CPU were forced to jump up to the more expensive $2,799 version of the laptop – a less-than-ideal solution for those just looking to boost either their processor speed or storage, but not necessarily both. Apple has now given purchasers the option to customize everything on the baseline version of the Retina MacBook Pro. That includes bumping up the laptop's 2.3-GHz CPU to a 2.6-GHz or 2.7-GHz CPU (for an additional $100 or $350, respectively). 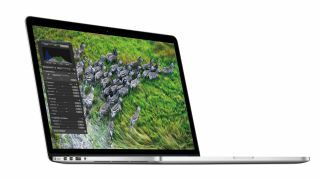 Cranking up the Retina MacBook's 256 gigabytes of flash storage will cost a purchaser $500 for a bump to 512 gigabytes or $1,000 for a jump to 768 gigabytes. Apple's also allowing users to customize the individual software elements within its iWork suite of apps that users would like preinstalled onto their devices. Not only can you customize your new MacBook purchase to a greater degree, but you'll also be able to receive it even faster.